Although the results of treatment for gastric cancer in Japan have improved, the prognosis of advanced stage disease remains poor [1,2]. Neither chemotherapy nor surgery alone has produced long-term survivors among patients with advanced disease. Our database of gastric cancer cases (11489 cases treated in our hospital from 1946 to 1994) shows that median survival time was 6 months for patients with noncurative surgery and 4 months for nonsurgically treated cases . Our conventional strategy for advanced gastric cancer (including extended radical surgery followed by postoperative chemotherapy) yielded a plateau in the survival benefit. However, recent chemotherapy regimens with high response rates [4, 5, 6, 7, 8, 9] seem to allow radical surgery for initially unresectable disease. 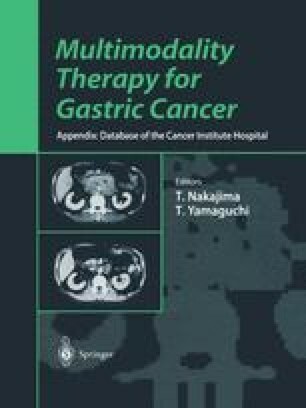 Since 1989 at the Cancer Institute Hospital, Tokyo, we have attempted to treat advanced unresectable gastric cancer patients with a four-drug combination chemotherapy with systemic and regional delivery followed by radical gastrectomy. The treatment results have been reported elsewhere .